Nanotube production is no small task, it takes a highly skilled engineer with a steady hand to make this powerful, yet delicate little piece of technology, a development that is taking the world by storm and changing everything we know about our limits. If you’ve heard of nanotechnology, then you know it’s small. Incredibly small. Like an ant in comparison to the sun. What you may not know is that nanotechnology is being developed in many different forms and for many different uses. Developments wrought from nanotechnology are currently being used in a variety of products you may encounter everyday including sunscreen, clothing, wrinkle-resistant fabrics, LCDs (Liquid Crystal Displays), scratch-resistant coatings, anti-microbial bandages, tennis rackets, deep-penetrating cosmetics and even swimming pool cleaners and disinfectants. One of the most compelling and exciting inventions in nanotechnology today are nanotubes. Nanotubes currently have a wide variety of applications, with the list growing in length every day and almost always made of carbon atoms. The most well-known molecular make-ups of carbon combine to make graphite (which is soft) and diamonds (which are hard). 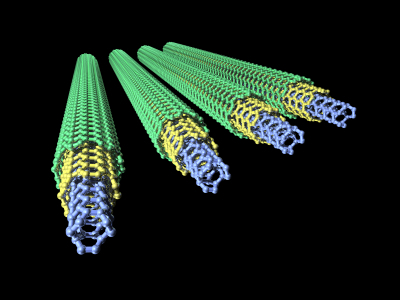 Carbon nanotubes are, in the simplest, just another make-up of traditional carbon atoms. And this ultra-tiny device is not incredible for its varied uses alone. Nanotube production in itself is an incredible feat for technology. The process of producing carbon nanotubes is done by rolling a sheet of carbon atoms into the shape of a tube. The strength of the tube is dependent on which way the sheet is rolled–this is due to the fact that carbon atoms will cluster differently according to their alignment. The resulting carbon nanotubes are one-hundred times stronger than steel but six times lighter. Due to this strange and fascinating versatility of carbon nanotubes, they can be used for many different projects, from construction projects on buildings and airplanes to medical procedures that require “tiny” solutions. Wind power turbines–While it is a well known fact that wind power turbines create electricity what you may not know is that the amount of electricity generated for collection is limited by the size of the turbines themselves. The turbines are often short because they are heavy. But carbon nanotube production means lighter, longer-lasting material. According to Bayer, a German chemical firm, the nanotubes will make wind power turbines between 20-30% stronger. Surfboards–US-based surfboard manufacturer, Entropy, has taken the process of producing carbon nanotubes and their application to a whole new level by using the technology to create a stronger epoxy–this epoxy increases the durability of Entropy surfboards while decreasing the natural wear and breakdown. Automobile improvements–BASF of Germany is harnessing the power of nanotube production to create filter fuel housings for new Audi vehicle models. This will make the vehicle lighter as well as reduce the necessary additives and the risk of sparking inside the casing. In addition, if carbon nanotubes could be used in the overall production process for automobiles, it would mean lighter vehicles, which in turn, would translate to better fuel efficiency and the added strength would greater increase the safety of vehicles for all passengers. Flame retardant boosters–Nanotube production does not mean the end for traditional flame retardants but BASF believes that small amounts of nanotubes added to traditional flame retardants will have a significant impact on the capability of the products. Pressure sensors–Although not currently proven, nanotubes have shown the ability to act as a pressure sensor, a discovery that could lead to the use of nanotubes in tire pressure gauges as well as in microelectromechanical pressure sensors that are used in the equipment that manufactures semi-conductors. Semi-conductors–The computer you’re using to view this information is running on a microprocessor which gets its life, in part, from a semiconductor. Semi-conductors made with carbon nanotubes would be stronger, lighter, paper thin and possibly faster than those currently used in computers and other electronic devices. In addition to the above applications, nanotube production shows strong evidence of working in the favor of medical practitioners. Nanotubes have been used to detect tumor cells in the human body and could even be used to enhance the human body phsyically. However, there are many ethical dilemmas as well as risk factors associated with nanotube production for use in medicine, ethically, whether it is right to enhance the human body physically (in other words, attempt to make yourself indestructable) as well as risk factors including the ability of such particles and tubes to enter the blood stream and reach the brain, causing permanent damage. The implications for the use of nanotubes is spread across every field of work, every business and into the home of every human being. If you drive a car, if you have surgery, if you use a computer, if you home ever catches fire, if you love to surf or ski, if you use electricity, every feature of life as we know it is or will be impacted by the discovery and development of carbon nanotubes. Whether the production of these nanotubes is ethical and no matter the risk factors, this fascinating discovery is here to stay. Whether you realize it or not, some form of nanotechnology has made a home for itself in your life and before you know it new uses will be coming to a store shelf near you. This entry was posted on October 6, 2009, 3:49 pm and is filed under nanotubes. You can follow any responses to this entry through RSS 2.0. You can leave a response, or trackback from your own site.